A large and noisily supportive audience crammed into the SVA to hear ten of Gloucestershire's most talented writers read their superb stories. Thank you and congratulations to these brilliant authors. Thank you who everyone who turned out last night (Sunday 19 April) for the sell-out SSS event at the SVA. They enjoyed a evening of memorable stories told by extremely gifted short story writers. Undoubtedly one of the best SSS events of all. It was an honour for Stroud Short Stories to showcase such talent. More here - read Debbie Young's wonderful blog. The next Stroud Short Stories event is on Sunday 19 April 2015 at the SVA, John Street, Stroud, GL5 2HA. Doors 7.30 for prompt 8.00 start. Tickets have sold out. These are the stories and authors chosen - in the running order for the evening. SSS organiser John Holland is being interviewed today (Tues 14 April) on Chris Baxter's Show on BBC Radio Gloucestershire after 4pm. It's a double header with A Feast of Stories organiser Philip Douch. 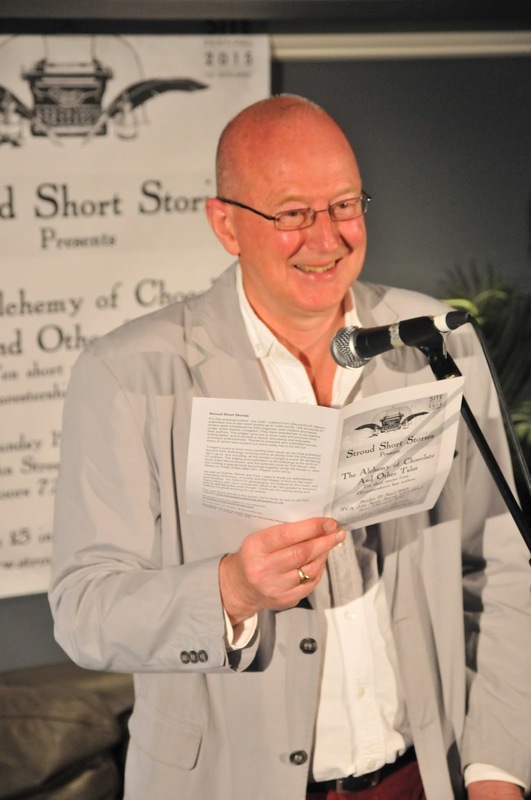 All tickets for the 19 April Stroud Short Stories event, The Alchemy of Chocolate and Other Tales, have now sold out. Thank you to everyone who bought tickets. The SVA's venue is now full. There will be no ticket sales at the door.